Join us at YYZ as Randi Nygrd hosts a walk-through presentation of her exhibition, Careful Management and Study of Relations. Take this opportunity to hear from and speak with the artist about her work in an informal setting. The main work in the exhibition is titled Ecology and Economy, Careful Management and Study of Relations which consists of a series of collages of text and images departing from the definitions of the terms ecology and economy in the Oxford Etymological Dictionary. By defining the words and then combining them, sentences are formed that function both as titles and guidelines for the work. The sculpture of layered mirrors and photos of patterns in nature is an attempt to manifest the hypothesis which explains that time is not a fundamental structure, but that it appears between things in the universe; so if you imagine cutting the world into pieces, the different parts may function as clocks for each other. Some people can learn a new language in two weeks. They say they can do it by applying an intuitive understanding of what a word means depending on its sound, length, and rhythm. Words starting or ending with the same sound will stand for similar visual forms to them. As such, in the drawing titled Strek Struktur each line follows the former, starting with a straight line that is then repeated by hand creating bumps, cracks, and a complex structure. It is a visual and bodily meditation on the fact that in Germanic languages most words that contain Str stand for something long and thin, such as strek, stripe, strk, which all can mean line, in Norwegian. 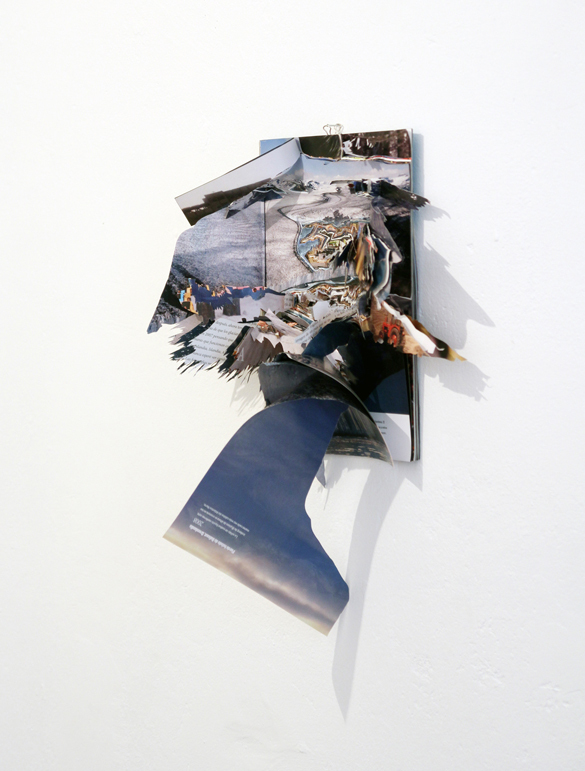 The work titled To Imagine the Real -Climate Change and The Atlas of Human Brain Connections consists of two books sliced into each other uniting and opening images of the climate change seen in landscapes and the human brain. In these intersections, between the flat and the spatial, the figurative and the abstract, the scientific and the poetic, there is a wish to see the world in a more open and interconnected manner. RANDI NYGRD received her Masters of Fine Art from the Kunstakademiet i Trondheim, NTNU, Norway (2006). She has exhibited her work internationally with recent exhibitions at Kunstverein Springhornhof, Germany (2013), Akershus Kunstsenter, Lillestrm, Norway (2013), and Performa 13, New York (2013). In the fall of 2013, Nygrd participated in the URRA Artist-in-residence program in Buenos Aires. Her work was recently acquired by The Collection of Stockholm Laen in Sweden. Nygrd currently lives and works in Berlin, Germany and Oslo, Norway. Read Careful Management and Study of Relations by SARAH JANE GORLITZ and WOJCIECH OLEJNIK, an essays published alongside RANDI NYGRDS exhibition. Randi Nygrd would like to acknowledge the generous support of the Office for Contemporary Art Norway.